Abstract: A 67-year old male, was diagnosed as a hepatitis B carrier in the 1980s. The use of lamivudine could not control the rise of his liver enzymes ALT and AST. He participated in a clinical trial but the result was dismal. He again participated in another clinical trial and at the same time took liver herbs and changed to a healthy diet. His ALT and AST levels returned to normal. About a year later, he went on a “bad diet” for two weeks and this caused his ALT and AST to escalate again. He took Adefovir at the same time continued taking herbs. His ALT and AST returned to normal. his diabetes improved and his pancreas, according to his doctor, had rejuvenated. Declaration of Interest: The authors are pracatising herbalists as such have financial interest in the use of herbs mentioned in this article. Hepatitis B is caused by a highly contagious virus that infects the liver. This virus is said to be a hundred times more infectious than the AIDS virus. It affects all age groups (1). As a result, hepatitis B is the most common infection in the world today. It is said that about 2 billion (1 out of 3) people have been infected with hepatitis B virus (HBV) worldwide and about 400 million people suffered chronic infection. And each year about 10 to 30 million people more continue to be infected with this virus (2, 3). Infection by hepatitis B is relatively uncommon in the United States and the Western World, but is endemic in countries of South East Asia, sub-Saharan Africa and the Pacific Islands. In China, Indonesia, Thailand, etc., as many as 25% of the population may become infected with HBV since early childhood (4, 5). HBV is found in the blood and body fluids of infected people and can be spread through sexual contact, the sharing of needles or razors, from mother to infant during birth, and by living in a household with a chronically infected person (1). Chronic infection with HBV can cause life-long infection (6) leading to liver diseases such as cirrhosis, primary liver cancer or hepatocellular carcinoma (1, 2). Any of these conditions can be fatal. About 15 to 25 percent of people with chronic hepatitis B die of liver disease (7). According to the Hepatitis B Foundation (3), worldwide death each year due to hepatitis B and its complications is estimated to be one million. This works out to approximately 2 deaths each minute. About 25% of chronic HBV carriers have inflamed liver and their blood tests will usually reveal elevated alanine aminotransferase (ALT) and aspartate aminotransferase (AST) activities (5). The ultimate goal of treatment is to eliminate the HBV from the body. If this cannot be achieved then the next logical step is to try and suppress its replication in the body (2). To date, the U.S. Food and Drug Administration (FDA ) has approved several hepatitis B drugs for use in adults. They are interferon alpha, pegylated interferon, lamivudine, adefovir, and entecavir (8). Eradication of HBV can occur with the use of drugs such as interferon. But unfortunately not everyone respond to this therapy. In fact, most specialists believe that lamivudine is a better, first-line alternative. (2). Lamivudine – is an orally administered nucleoside analogue that inhibits the DNA polymerase of the HBV. However, the use of this drug showed two drawbacks. One, the liver inflammation may recur after the drug is discontinued. Two, about 10 % to 20% of patients on lamivudine became resistant to the drug due to mutation by the HBV (5). Other treatment options for chronic hepatitis B include other nucleoside analogues such as Lobucavir, Adefovir. Thymosin, a polypeptide hormone is also used to stimulate the immune system (2). Adefovir is not a cure for HBV virus, but it may lower the amount of HBV in the body or it may lower the ability of the virus to multiply in the body (9). Adefovir was found to work well in people who had HBV that was resistant to lamivudine. However, chronic administration of Adefovir may result in nephrotoxicity (10). Pyrsopoulos and Reddy (4) did not consider the need to restrict any diet for patients with acute and chronic hepatitis. However, those with liver cirrhosis need to be on low-sodium and high-protein diet (i.e., white meat protein such as pork, turkey and fish). Shannon also took a similar view. She wrote: No specific diet has been shown to help in treating hepatitis (11). Palmer (2), however, felt that dietary restriction for patients with liver problems is necessary. If we understand the biology of the liver, it stands to reason that everything that enters the body must pass through the liver to be processed – either synthesis or detoxification. Thus everything that we ingest will have some beneficial or adverse effect on the liver. It is for this reason that people – whether sick or healthy – should eat a diet with the eye towards protecting liver health. This is even for important for people with liver disease. At CA Care (in Malaysia), we advised cancer patients (including those with hepatitis) to avoid alcohol and caffeine, processed food, polyunsaturated oil, table salt, meat, white sugar, milk and dairy products (12). A 67-year-old man from Singapore. Sometime in the 1980s he was diagnosed as a hepatitis B carrier. In the years from 1980 to 1996, regular monitoring through blood tests, indicated liver function values to be within normal limits. There was nothing to be worried about and there was nothing to be done too. However, on 28 December 1996, a CT scan report indicated a tiny (few mm) hypodense nodule seen in the medial segment of the left lobe of liver close to its diaphragmatic surface. This was too small to characterize. It could represent a small cyst. Moreover, his liver enzyme values shot up to 61 (ALT) and 44 (AST) (Table 1). In June 1998, he suffered a silent hepatitis-related liver infection but with no indication of jaundice. He continued to feel all right with no apparent discomforts. The CT scan of the liver done on 25 June 1998 indicated a few tiny hypodense foci seen in both lobes of the liver. They were too small to characterize accurately but could be due to tiny cysts. The increase from one spot in the liver to many spots perhaps indicated gradual deterioration of his condition. In 1998, he moved to live in Wichita, USA. He continued to feel good but noticed a darkening of his urine. The values of his liver function tests were erratic and were consistently at the levels above normal limit. As a result, in early December 1998, the doctor put him on medication – lamivudine, 100 mg. There were some indications of improvement after taking this drug (Table 1). After two years on the drug, the problem returned when he suffered a chronic liver infection and his ALT and AST levels shot up high (Table 2). In June 2000, the patient returned to Singapore. He continued to take the drug, lamivudine until October 2000. The blood test results done on 24 July 2000 showed values far above normal range (Table 2). A biopsy of the liver, done on 29 August 2000 indicated moderate chronic hepatitis with mild fibrosis. In short, he was getting worse even with medication. With no other option left, he decided to participate in a clinical trial (where the drugs entecavir was tested and evaluated against lamivudine) conducted in Singapore. Unfortunately, the response was unfavourable. His ALT shot up, sometimes up to 812 and his AST rose to 388. he dropped out of the above clinical trial on 23 October 2000. Then on 12 February 2001, the doctor in Singapore recommended that he participates in another clinical trial. This time he was put on both entecavir and lamivudine. The trial was completed on 13 May 2002 with a positive result (ALT=21, AST=23). On 23 December 2001, he came to see us in Penang and was started on our liver herbs: Capsule A + B, Liver-P and LL-tea. In addition to herbs, he was asked to change his diet and avoid meat, milk and dairy products, oil, white sugar and table salts. This means he was both on our herbs and his doctor’s medication (entecavir and lamivudine). On 13 May 2002, he went off the second clinical trial and stopped all doctor’s medication. The doctor continued to monitor him monthly and was very pleased with the state of his liver and its function. The blood test showed values within normal limit. An ultrasound of the liver done on 29 November 2002 indicated that the liver parenchyma was of homogenous echnogenicity and no focal lesions were seen within it. The results of his liver function test were all within normal limits (Table 2). The patient wrote to us saying: After Christmas 2002, when I started taking the herbs, I did find positive effects on my personal health. My facial outlook seemed to be healthier. Even my endocrinologist remarked that my diabetes was much better and very well under control. He even said that my pancreas has rejuvenated. I had new growth of black hair; the slightly bald patch at the back of my head became less bald. The patient sent us an e-mail: My most recent blood test done on 6 February 2003 showed ALT=28, AST=27, both values were within normal limit. On 24 February 2003 we received a fax from the patient saying that the herbs helped me a great deal and they really strengthened my immune system, enjoying general health of body, mind and spirit. I also took your advice to eat right and to be free from stress. Indeed God is great and is an awesome Healer. His health was fine until June 2003 after a two-week trip to Cambodia. During this time he was not taking any herbs and worse still was a on a “bad” diet. 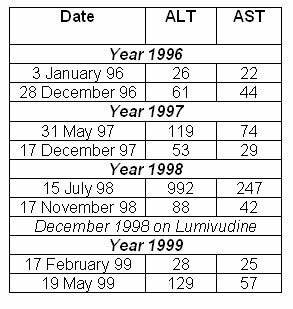 As a result in July and the next few months his ALT and AST levels were very much elevated (Table 3). He came to see us in Penang and was asked to go on the herbs more seriously. On 23 September 2003, he wrote: My diabetes is very well under control. For nearly a year now, I had to reduce my insulin intake. In fact, my endocrinologist told me that my pancreas has rejuvenated and that I’m no more dependent on insulin. My lipid result is excellent. In response to our enquiry he wrote on 27 September 2003: I am not on any doctor’s medication for more than a year already (note: 2 nd clinical trial completed in May 2002). On 29 September 2003, he again wrote: Interestingly, from the scan of my liver, I noticed that in 28 December 1996, the finding was: “A tiny (few mm) hypodense nodule seen in the medial segment of the left lobe of the liver close to the diaphragmatic surface. This is too small to characterize. It could represent a small cyst”. From my most recent scan which I sent you showed NO MORE of such cyst. On 12 December 2003, he wrote us again: Since 9 December 2003 my hepatologist has prescribed for me 10 mg of Adefovir. I still feel fine and am in good health. Your herbs which I take regularly have, I believe, done me good. As I’ve told you, the ultrasound of my liver has improved. The liver seems to be in good shape. On 13 February 2004, we received an e-mail from him: My diabetic situation is very well controlled. I give myself a reduced dosage of insulin twice a day… In fact, my doctor was surprised that my pancreas has rejuvenated, so much so, if I diet carefully, I may not even need to have insulin. But, for the sake of maintaining my body weight and health, I was advised to give such reduced rate of insulin. By March 2004, his ALT and AST level had gone back to normal (Table 3). On 8 December 2004, he wrote to say that he was doing very well. He wrote: I believe the herbs as well as eating right have kept both of us (husband and wife) healthy and fit. The liver is of normal size and has a smooth outline. There is a small echongenic lesion seen in the left lobe of the liver, 5mm in size, this may be an incidental hemangioma. No other focal lesion is seen in the rest of the liver. COMMENTS:There appears to be a small echogenic lesion, 5mm in size, in the left lobe of the liver and this may be an incidental haemangioma. The liver, otherwise, shows normal appearances. As of this writing the patient is doing well. His liver seems to be functioning well and his liver enzymes are all within normal range (Table 3). On 1 December 2005, we received a reply from him regarding our enquiry: Question: You started taking Adefovir in December 2003 – are you still on this medication? Answer: Yes, but the doctor will take me off Adefovir by mid-December 2005. This means that I shall have been on this drug for two years (of course, all this years I have been taking your herbs). One question on our mind is: What causes the drastic reduction of his ALT and AST – the Adefovir or the herbs? It could be due to Adefovir entirely, or it could be due to both – Adefovir and herbs acting in a complementary way. Our experience with liver cancer patients over the years showed that herbs were also able to normalise liver enzymes and slow down the progression of the liver disease. Below is an e-mail which we received on 13 May 2004 from Singapore and is self-explanatory. Since last year Aug 2003, I have been taking your herbs as per your prescription: (a) Cap A and B, 3 times per day, b) LL tea as drinking water c) drink Liver P, once a day. I would like to share with you my blood results done last week, 4 May 2004. I am very happy that your herbs had worked and helped to reduce the level of my liver enzymes to an acceptable level. (ALT 33 u/l and AST 22 u/l). Table 4: Normalising of ALT and AST values with herbs. 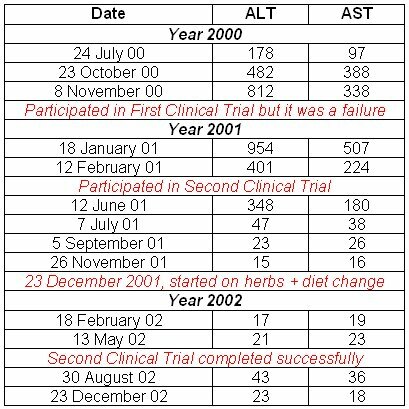 Lim started taking herbs in early August 2003, and within two months, his ALT and AST were back to within normal range (Table 4). In Lim’s case, he was not on any other medication. Our experiences also tell us that for mild cases, ALT and AST could be normalised within two to three months after consuming the herbs. However, in the case of our patient, it is logical to assume that Adefovir could have made significant contribution towards the rapid reduction of his liver enzymes. Contrary to popular belief, this case brings forth one important point, and that is the consumption of herbs together with pharmaceutical drugs does not cause harm to patients. We believe that taking herbs can do a lot of good to patients. Glen Miller (13) wrote: Chinese medicine fills a need sorely felt in today’s world. The efficacy of Chinese medicine can rival that of Western medicine – and for many chronic illnesses, Chinese medicine is actually more effective and a better choice. It is amazing to note that the patient’s diabetes has improved tremendously and his pancreas, according to his doctor, has rejuvenated well. This is the beneficial side effects of herbal consumption which we often see among our patients. Many cancer patients reported that their high blood pressure returned to normal and they need not take their pills any more after some months on the herbs. Some patients found that their migraine had disappeared after some months on the herbs. Some patients said their gray hairs turned black after taking the herbs. Therefore, it is no surprise for us to note that he reaped similar benefit with regards to his diabetes and his hair. One significant lesson which is demonstrated in his case is the role of diet in the maintenance of his health. After the completion of his second clinical trial in May 2002, he was not on any medication and yet his ALT and AST levels were within normal range. It was not until June 2003, when things flared up again. From our experience with cancer patients, we know that they would suffer a relapse after they revert to a “bad diet” and the symptoms can be seen or felt two to three months later. 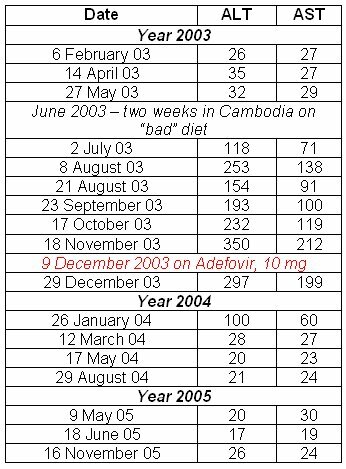 So, it is no surprise that after his Cambodian trip his liver enzymes started to escalate in July 2003. While the role of diet is not appreciated by most allopathic doctors, we have found that diet played a very significant role in the progression or reversal of diseases. Colin Campbell (14) had shown that diet could turn on or off the initiation and progression of cancer in mice and humans. Russell Blaylock (15) wrote: It is a crime that modern medicine has all but ignored one of the greatest weapons we have against disease – nutrition. He also concurred that nutrition not only could prevent but also reverse diseases. We would like to thank the patient for being very diligent in keeping his records and his willingness to share his healing experience with us. Without his contribution it would not be possible for us to practise evidence-based herbal therapy.